Newcastle looked set to hold on for a point at St. James' Park on Sunday after DeAndre Yedlin was dismissed for a crude foul on Diogo Jota, who opened the scoring for the visitors. But Wolves had other ideas with Doherty popping up to nod the ball into the open goal after unlucky goalkeeper Martin Dubravka could only parry a drive from Jota. Wolves' first away win in the Premier League since October follows their midweek win over Chelsea as Newcastle's earlier equaliser from Ayoze Perez proved meaningless. Wolves took the lead in the 17th minute, though, Helder Costa's cross finding an unmarked Jota with his powerful close-range finish going through Dubravka. 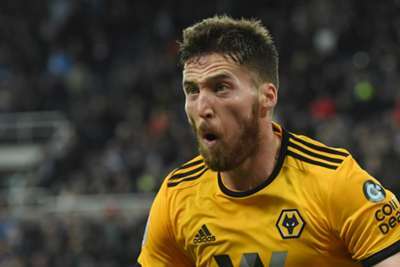 The United States international, playing out of position as a centre-back after Fernandez's injury, took a bad touch that allowed Jota to get in front of him, he then dragged the Wolves attacker down as he approached the penalty area. But in the fourth minute of added time Wolves secured the winner, Doherty on hand to net for the second away game in a row, this time beating the helpless Dubravka after he saved from Jota. A run of three straight wins moved Newcastle away from the relegation zone but they are slipping back towards the bottom three after taking a single point from their last three games. Wolves are up to 10th having bounced back from their own poor run of form in some style. For all their canny investment in the transfer window following promotion from the Championship, Wolves lack a truly reliable goalscorer. But in Jota they have a forward who appears increasingly comfortable in the Premier League. He took the opening goal well and as the game appeared to be petering out into a draw, forced the save that led to Doherty's winner, having also found the net against Chelsea at Molineux on Wednesday. While a moment of madness from Yedlin was ultimately costly, Newcastle captain Lascelles also endured a difficult game. He failed to pick up Jota for the opening goal and was out of sorts throughout, a headed chance in the Wolves box somehow ending up with the ball behind him summing up a dire display. Wolves are at home to Bournemouth on Saturday, when Newcastle travel to Huddersfield Town in another crucial encounter at the bottom.